The UNB Associated Alumni has named the 2011 winners of its Proudly UNB Awards which recognize individuals and groups that have made significant contributions to the association and the University of New Brunswick. In addition to its long-standing Alumni Award of Honour, the Proudly UNB Awards also include the Alumni Award of Distinction, the Young Alumni Achievement Award, the Alumni Volunteer of the Year Award, the Alumni Group of the Year, and Honorary Membership in the UNB Associated Alumni. Collectively, the Proudly UNB Awards recognize individuals and groups that have made significant contributions to the association and the University of New Brunswick. The Alumni Award of Honour, which was instituted in 1971 and recognizes truly outstanding service and commitment to UNB and the Associated Alumni, remains the association’s most prestigious award. This year’s winners of the Alumni Award of Honour are Barry Beckett of Saint John, long-time UNBSJ chemistry professor and registrar emeritus; John McLaughlin of Fredericton, retired president of UNB; and Carey Ryan of Saint John, retired educator and community activist. The Alumni Award of Distinction recognizes the significant contributions made by UNB alumni in their local communities and beyond, for which they have been recognized regionally, nationally or internationally. This year’s recipients are Wyatt Inman of Montague, P.E.I., a tireless volunteer, particularly in the area of physical fitness; Marcel LeBrun of Fredericton, CEO of high-tech firm Radian6; Wayne Long of Saint John, part owner and president of the QMJHL’s Saint John Sea Dogs hockey team, winner of the 2011 Memorial Cup; Gerald O’Brien of Kiersteadville, N.B., a well-known lawyer, businessman and community activist; and Jason Stephen of Saint John, who has worked diligently on behalf of UNBSJ and the local community since his student days. The Young Alumni Achievement Award recognizes the outstanding achievements of UNB alumni within 10 years of receiving a bachelor’s degree or within five years of receiving a graduate degree. The 2011 recipients are Cayman Grant, of Los Angeles, an actress and filmmaker; and Justin Rowe of Montague, P.E.I., a natural/health foods entrepreneur. Honorary Membership in the UNB Associated Alumni is granted to individuals who are not UNB graduates, but who have rendered outstanding service to the association and UNB. This year’s recipients are Flora Beckett of Saint John, and Lois Walker Gillin of Fredericton. The recipient of the Volunteer of the Year Award has made a significant contribution to advancing the objectives of the Alumni Connections Program, either by being a member of a Connections group or individually. The 2011 Volunteer of the Year Award went to Rick Fisher of Vancouver. The Group of the Year Award recognizes the group that has made significant contributions to UNB alumni, students, the university or the Associated Alumni during the past year by holding events, demonstrating growth and/or undertaking new initiatives in support of these groups. This year’s honour went to the Calgary Chapter. 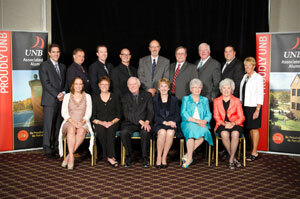 The awards were presented during a recent gala dinner in Saint John.